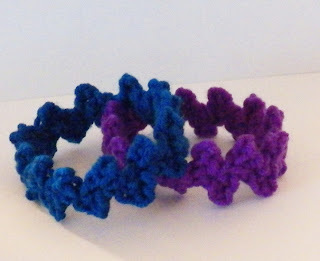 This is the easiest of all my crocheted bracelet patterns. It's just chains and single crochets, worked in a strip then sewn together to make a ring. My daughter loves her chunky soft bangles, including these. The ones shown above were made using Lion Brand Fun Yarn, which is an acrylic yarn that comes in small skeins that using a 20% off yarn coupon at my local Fred Meyers costs 80¢. It comes in bright colors, and I got several skeins for my daughter to use in her projects. Break off yarn and stitch ends together, making sure they aren't twisted. Weave in ends. Size it up or down in 2 row increments. This simple technique creates a nice soft zig-zag effect and works up super fast. Great way to use up small amounts of yarn. It can be done in other yarns, just use a hook size that's 1 or 2 smaller than the hook recommended and increase or decrease the rows as needed for length. Good project for beginning crocheters or crocheters who just want a super simple tv watching project.